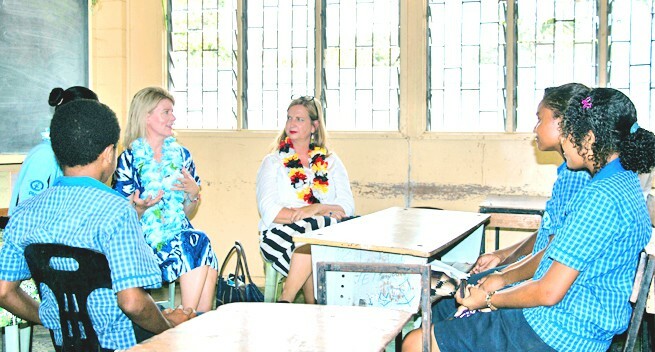 Australian Ambassador for Women and Girls Natasha Stott Despoja AM has commended a group of school children for their commitment to ending violence against women. Ambassador Stott Despoja visited Philips Aravure Primary School at Gerehu in Port Moresby recently join students in a session with Equal Playing Field (EPF). EPF combines relationship education with skills development and games, using sports to connect with young people on the need to treat each other equally and respectfully. Ambassador Stott Despoja said she was impressed by the sense of fair play shown by the students. “It’s so wonderful to see you all having such a great time, while you’re thinking about some quite serious issues,” she said. “Sport is all about playing by the rules, and respecting your opponents. And it’s great to see you all thinking about how you can also apply these values off the field, in everyday life. “Having respectful relationships means treating each other in the way that we would like to be treated. It means communicating assertively, not aggressively, and ensuring everyone remains safe and secure," she added. EPF conducts eight-week programs based around sport, empowering girls and helping boys to find ways to be active and physical without violence. The program has reached more than 14,000 students since it began in 2011. EPF Chief Executive Officer Adam Everill and In-Country Program Manager Jacqui Joseph said schools involved in the program had noticed significant changes in the behaviour of students. The Australian Government supports EPF and a range of programs in partnership with the Government of Papua New Guinea, to advocate for gender equality, including ending violence to improve outcomes for women and girls. Ambassador Stott Despoja is in Papua New Guinea with her United States’ counterpart, Catherine Russell, for the FIFA U-20 Women’s World Cup.